A person's imagination has always been valued since the time they first entered kindergarten through their working stage in life. A person's imagination is a rather vital aspect of their mental capability and allows a third party to understand that person's mental capacity better. Because today's society is so routine filled and somewhat dull and boring, our imaginations are suppressed with each day we further succumb to the system created by the consistently busy society. Are you looking forward to bringing some of your imagination back to where it was during your years of elementary school and preschool? Then allow your views to expand and try out the Romeo Y Julieta Reserva Real Lonsdales Cigars for yourself. 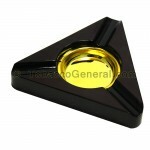 From the moment you ignite your lighter and put it to your exclusive Romeo Y Julieta Reserva Real Lonsdales Cigar to the point where the burning comes to a complete stop after the whole cigar is burnt, your imagination will receive a sharpened edge and will soar through the ceilings, guaranteed! As you hold the Romeo Y Julieta Reserva Real Lonsdales Cigar in your hand, scrutinize its extravagant design; the gentle finish with an Ecuadorian Connecticut wrapper gives way to the keen Dominican & Nicaraguan long fillers with an impeccable binding. Allow your imagination to run fast and run hard as each of the Romeo Y Julieta Reserva Real Lonsdales Cigars provides you with a very memorable medium-bodied smoking experience that is blessed with a combination of many different tropical flavors. Consumer ratings target the mid 90s when it comes to ranking the burn, consistency, draw, appearance, taste and construction of these Romeo Y Julieta Reserva Real Lonsdales Cigars. Each of the Romeo Y Julieta Reserva Real Lonsdales Cigars is 6 5/8 x 44 in dimensions and is designed carefully in the Dominican Republic. 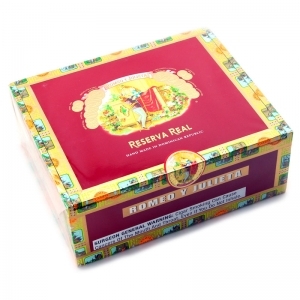 This listing of Romeo Y Julieta Reserva Real Lonsdales Cigars is listed with an option to buy a Box of 25, pack of 5 or by the single cigar. Tobacco General is offering very low prices on these exclusive Romeo Y Julieta Reserva Real Lonsdales Cigars in order to assure maximum consumer satisfaction. Try them for yourself an embark on a journey of limitless imagination!